How to keep your Pug happy and healthy indoors? With the cooler weather and rain in Fall, Kilo the Pug and I tend to spend less time outside. I’m always looking for new ways to keep him mentally and physically active. He sleeps and cuddles a lot but needs to play, train and zoom every 2 hours for at least 5 to 10 minutes. Plus I like him to work for kibble, so we play games throughout the day. Here’s our list of fun games to play with your pug to keep them entertained indoors. Comment below to add your games to the list. 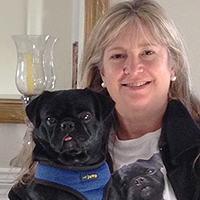 Use your time inside to teach your pug a new trick or obedience and focus. Make sure to keep sessions short and fun with lots of positive reinforcement such as treats or cuddles. Dancing with your pug or Canine Freestyle can be a really cool way to bond and get fit with your dog. Kilo has some amazing spins and jumps. You can either hide yourself, a family member, a treat or your pug’s favourite toy. This is a fun game for your pug that plays on their natural instinct to track, retrieve, herd and hunt -plus they love it when they find you. It’s like a treasure hunt for your pug. Kilo loves his BUSTER ActivityMat By Kruuse that comes with 3 levels of difficulty to keep your pug challenged. It’s customizable to different sized dogs, portable and easy to take on the go since everything fits neatly in the handy bag provided. It comes with a handy guide for how to set up the various tasks to try. More complementary activities can also be bought. See The Full Review HERE. The BUSTER ActivityMat starter set includes the mat, a storage bag and three different tasks. Examples of tasks include envelopes with Velcro closers and pockets that are connected in different ways via ties or wooden sticks, which must be removed in order for the dog to get to the enclosed treats. Pet owners should always be present with their pet when playing with the mat. Kilo also loves his various food puzzles and I love challenging him so he does not eat too fast and exercises his brain while eating. Treat balls are a great way to keep your pug entertained and mentally stimulated as they work for their treats. Kongs are also great for stuffing. Attend agility classes at local dog facilities like PawsWay Toronto, or try setting up your very own agility course in your house for your pug. Just make sure it’s safe. Be creative and make a simple obstacle course inside your home with pillows, towels or old blankets. Make sure to clear enough space so your pug can run freely without hurting himself or damaging valuables. Doga or doggy yoga or yoga with your dog could be a fun way for both you and your pug to relax and have fun bonding together. Kilo just jumps on me but we still have fun stretching. I taught Kilo how to roll out his yoga mat by hiding kibble pieces rolled into it. He finds it a very rewarding game. Trouble is he now unrolls any mat he sees in search of snacks so my daughter has to remember to put hers away. This dog game is favoured by many working and sporting dogs. But pugs love it too! For some, it is even more motivating than treats and can burn some good energy off quickly. Kilo really loves playing Tug-of-war so we play a few times a day. Make sure you have a toy that is soft and comfortable for your pug to hold in its mouth. Kilo does not like rope and has small teeth so we generally just use his plush toys. Playing tug with your pug can be a great way to work get in some basic training like the “Drop It” or “Give” commands. Kilo guards resources so we practice dropping and trading the toy with me for treats. For some extra training on your pug’s self-control, try adding in throwing in a “Sit” and “Stay” before letting your dog have the toy to play with. Make recycling in your house super fun. Kilo the Pug loves to play with empty plastic water bottles or containers. I suggest using sofas at each end of the house or towels as goals and make it a soccer game. Kilo has an absolute blast chasing and pushing and running with the bottle. He loves the noise it makes, biting on the crunchy plastic and the way it moves. If you have access to an indoor pool – playing Dog Games in a pool and swimming can also be fun for pugs. If you don’t, pugs can fit in most household bathtubs. Just make sure the water is at a comfortable warm temperature and supervise carefully. Swimming can be a gentle and safe way for your pug to exercise since it has many health benefits for pugs. It can also be a great option for older pugs as it’s . Kilo the Pug is not a fan of getting wet, swimming or strangers, so this game is not a good fit for us. However, I took our senior dog Isabelle a few times in her last year and she LOVED it. Check out a local Doggy Swim Class like Fit Dogs Training Centres in Toronto HERE! What’s Your Favourite Dog Game To Play With Your Pug Indoors? I am Susan Nation and this is my Pug Kilo. Kilo and I found each other a year ago through Homeward Bound Rescue. Who could resist that little face? He had been through 4 homes in his 2 years. I had never had a pug before. They are a very special breed. I call Kilo my velcro dog. We both love food, games, cuddling and short walks. He has a few issues but we are working through them gradually using positive training. I started this blog to share my insights about living with Kilo the Pug, plus to share stories, pictures and videos about Kilo and other adorable pugs. Copyright © 2019 · Hop To It Productions Inc.